Mordy Labaton works as Hadar's Associate Director of Immersive Programs. Mordy was born and raised on the Jersey Shore where he spent his summers searching for uncrowded beaches. Following two years of study in a Jerusalem Yeshiva, Mordy attended the University of Maryland where he studied History and Jewish studies. 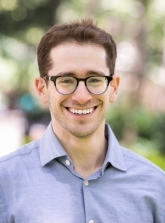 Prior to his current position at Hadar, Mordy was a fellow at Hadar's year-long Yeshiva program and worked on the development team at the New Israel Fund.